Great for family car campers and small groups, the Coleman Sundome 4 Tent sleeps four people comfortably. It measures 9’x7’, with a 4’11” center height. 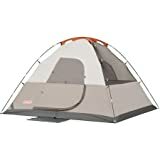 The Sundome 4 Tent features a new Ground Vent for improved airflow; a privacy vent window offers more ventilation; and you can control airflow with Coleman’s VariFlow adjustable ventilation. A convenient electrical-access port lets you run a cord from your device in the tent to a power supply outside. An interior gear pocket helps keep your things organized. Setting up this 2-pole dome tent is a breeze—it sets up in 10 minutes or less, thanks to color-coded poles and sleeves, shock-corded poles, continuous pole sleeves, pin-and-ring design and InstaClip attachments. Easy-to-follow set-up instructions are sewn right into the carry bag, so you’ll always have them handy. The frame is strong and wind-resistant, with 8.5mm fiberglass poles; the tent fabric is 68D polyester mesh and 75D polyester taffeta inside, with a 75D polyester taffeta flysheet. The durable carry bag includes separate storage sacks for tent, poles and stakes. Limited 1-year warranty.